Wall Color - Gorgeous space..... Can you provide wall color please? I used Valspar Premium color Urban Sunrise, almost same. Wall Color???? - What is the paint color & mfgr? It's exactly what I need for my living room project! BM Stonington Gray is gray with blue undertone. Try Repose Grey by Sherwin a Williams or Silver Strand. Beautiful rug, where is it from? Still looking for wall color? I was wondering if you could please tell me the colour of the stain used on the floors? 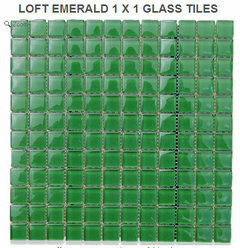 Green Backsplash - Even though the focus is on the living room, I spotted this amazing backsplash int he pic. 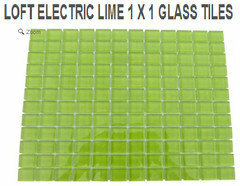 Looking for apple green backsplash is quite an ordeal....any info? Thanks! 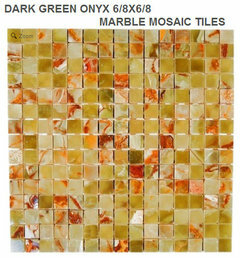 bathroom and kitchen tile are VERY different. Bathroom was frosted green glass subway tiles. Backsplash is handmade moroccan tile. Need an end table - Where might I buy the end table? I too would like to know where the couch is from. Thank you! Living Room - Where did you get the floor lamp? What colour and brand are on the gray walls? RULINK - COULD YOU LINK the WEBSITE FOR YELLOW GRAY RUG PLEASE THANK YOU!? Love the couch- anyone know where you can buy it?? If it is custom any ideas on who made it? Where did you purchase the carpet? The yellow one? Question about the beam above - Hi there! I love the open space you created! Wonderful design. I am so happy that I came across your beautiful pictures because I have been searching on Houzz for months trying to find ideas for our home. This is the first pic that I have found that is the closest to our home. Currently, we have a wall in between our kitchen and living room. My father in law made a cut out for me which has made it a better space for us. I would love to remove the wall however this wall is a supporting wall. My husband has informed me that we could put in a beam above (like what your room shows) we would need to put in a pole. My concern is that because the space is not that large, the pole will be in the way and the feeling of openness would be lost. Since you have the experience of working in a similar type of space I was wondering what your thoughts are around having a pole in the middle of the room? I am at a point where I would rather have a pole than the cut out wall. Any feedback would be appreciated. Thanks!! Can you tell me what the floor is and the finish? What is the clear material used to wall the drop off to downstairs? - Does the clear wall turn along the side of the lower stairs? Is there a railing on the lower stairs? We have a similar set-up in our home, so it is interesting to see an updated solution for split-levels. Nice work! Please share the wall color. It's the perfect share of gray! 4. Yellow wakes up neutrals. Whites, grays or beiges feeling a little blah? Lift your neutral basics with an injection of vibrant yellow. 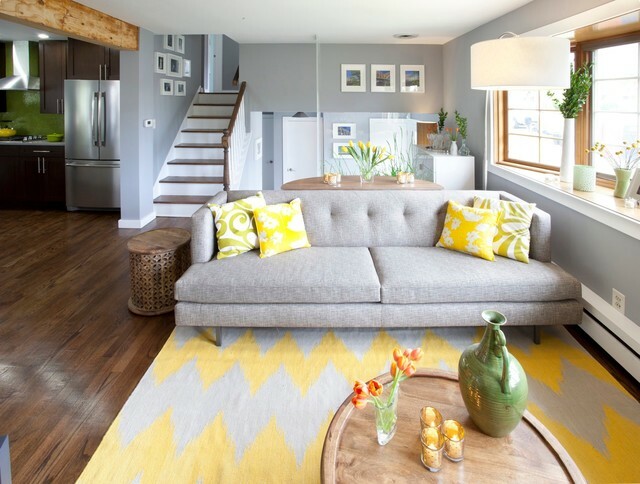 Yellow is so bold, it works beautifully as an accent color. Just a touch or two is all you need. Little darker, but same width as what we have.